1 of 3 Heat oven to 400 degrees . Coat squash halves with 2 tbsp of the olive oil. Sprinkle cavities with 1/4 tsp of the salt. Place cut side down on 2 baking sheets (4 halves on each sheet). Roast at 400 degrees for 30 minutes. Let cool slightly and scoop flesh out of 4 of the 8 halves and discard skins; place in a resealable container and refrigerate. 2 of 3 Turn on broiler. In a microwave-safe bowl, combine cooked wheat berries, pear, 1/4 cup of the Parmesan, the pecans, sage, 1/4 tsp of the salt and 1/8 tsp of the pepper. Microwave for 1 minute. Carefully fill remaining 4 squash halves with mixture. Sprinkle with remaining 1/4 cup Parmesan and broil on HIGH for 2 to 3 minutes, until cheese is melted and lightly browned. 3 of 3 Meanwhile, in a medium pot, heat remaining 1 tsp olive oil over medium heat. Stir in garlic; cook 1 minute. Mix in frozen kale and 1/2 cup water. Bring to a boil. Cover and cook 3 minutes. Stir in butter beans, lemon juice, remaining 1/4 tsp salt and remaining 1/8 tsp pepper. Cook 2 minutes, until beans are heated. 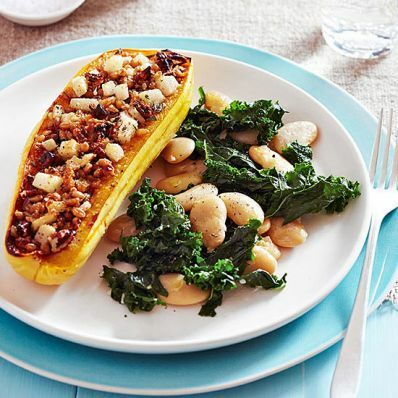 Serve with squash. Per Serving: 16 g fiber, 83 g carb., 3 g sat. fat, 9 mg chol., 16 g Fat, total, 516 kcal cal., 787 mg sodium, 21 g pro.